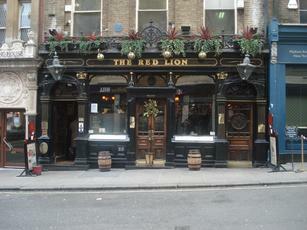 Beautiful Victorian gem, hidden away behind Picadilly. Very busy but friendly, Fullers ESB in excellent condition. Highly reccommended. Lovely interior - all etched mirrors. Fullers ESB at well over the £4 a pint mark. Should be expected. Arrived about 2.15 and it was still quite busy, got a seat in the little section behind the bar. Worth a visit just to see the Victorian glass panels/mirrors. Quite a few bar staff on but they were not in a hurry to serve or collect glasses as they were too busy chatting. 4 Fullers beers on, we had ESB & Discovery which were both fine. Got the impression that the manager was struggling with staff as he was having a go about all the dirty glasses piled up on bar, and when I told a barmaid that the ladies was flooded and had water coming through the light fitting she just shrugged, but manager came straight over and thanked me for letting them know. Change of staff and it would be a very pleasant place to spend a few hours. Popped in here for a quick pint after a long wander in search of a watering hole. Good ales and lovely decor as others have noted, but the whole place smells of stale beer. Others might find that authentic, but it makes it hard to persuade the other half to stay in such circumstances. The Red Lion was my second stop of the day after first visiting the Powder Keg Diplomacy in Battersea (not listed on here). The Good Beer Guide and other websites state that the pub opens at 11:30 on a Saturday. So I took a little walk around the area before returning at around 11:30. The barmaid had seen me on the cameras and opened up. But apparently the normal opening time is now midday on a Saturday (closed on a Sunday). I was the only customer during my short visit. This is a Fullers pub with 6 ales from their range - Fullers London Pride, Chiswick, Bengal Lance & Front Row & Gales Seafarers & HSB. Although there may have been another couple around the other side of the bar. I plumped for the Aspalls cider. The real value of this pub is the interior. The walls are lined with crystal clear glass and this is a fine example of the old Victorian gin palace. The single room itself is small and curves around the central bar. I can imagine the place gets very busy with local office workers on weekday lunchtimes. A trip to the toilets is an interesting experience. Watch your head and your step if you negotiate the staircase down to them.